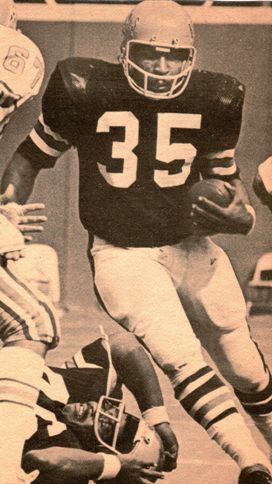 Charles “Boobie” Clark played tight end in college but, chosen by the Bengals in the 12th round of the 1973 NFL draft, was shifted to fullback, a position he had played in only one game collegiately. Cincinnati was in need of a heavy-duty power back and, despite Clark’s inexperience at the position, he moved into the lineup. He teamed well with veteran HB Essex Johnson and both nearly reached the thousand-yard rushing threshold. A broken arm limited Clark to eight games and 312 rushing yards in 1974. He came back to run for a club-leading 594 yards and catch 42 passes for 334 more yards in ’75. Clark followed up with 671 rushing yards in 1976 but lost his starting job to rookie Pete Johnson in ’77. After one more year as a backup in 1978 Clark was waived and, while he caught on with the Houston Oilers, saw scant action in his last two seasons. For his career, he rushed for 3032 yards (2978 with Cincinnati) while averaging 3.8 yards per carry and scoring 26 touchdowns. Clark also caught 157 passes for 1197 yards and another two TDs.